It’s like deja vu all over again at Muskellunge Lake this week. Thanks to Linda Grenzer’s vigilance, we have learned that the productive and photogenic pair on Muskellunge came back together this week — just as they did about this time in 2014! As Linda’s photo shows, “Clune” and “Honey” (Linda’s names for the banded pair) were a bit wary of each other at first. This shyness should not be surprising, as they have both lost their breeding plumage and donned winter attire. According to Linda, though, they rather quickly recognized each other and paddled off contentedly together. Apparently after 6 years of being together, and rearing of 10 chicks to fledging, familiarity with your partner involves more than just feathers! We have very poor information on the behavior of territorial loons in the fall, so we can only speculate about what it means that an established pair seems to come together routinely just before fall migration. As a behavioral ecologist, I am inclined to interpret such meetings as more calculating than romantic. I cannot resist the temptation to view such a meeting as a final patrol of this precious breeding lake by its owners to ensure that no intruders have tried to put down roots in hopes of claiming Muskellunge in 2017. To any such pretenders, the presence of a tight pair late in the fall would signal that the territory was not available without a costly battle. But that is just speculation. and 19 years of age survive at a rate of 94% annually, while those 20 years and older survive at an estimated rate of only 71% (see graph, above). That is a steep drop-off in survival rate, indicating clear senescence. But the newer, more robust dataset has shown that females are not immune to the march of time. Indeed, 5 to 19 year old females survive at about 94%, like males; 20+ year old females fall off to 79% survival (see above graph). It is a tad deflating to realize that the world was more complicated than I had reported before, but also a relief to know that — and don’t take this wrong — females are not immortal! territory; see graph above). In contrast, females show steady survival of about 92%, regardless of age or territorial status (see above graph). Males, in addition, suddenly begin to lose their territories to eviction at the rate of 38% when they turn 15 years old, while females only suffer eviction at a rate of 12% from 4 to 18 years of age. So here we have evidence that males not only die at a higher rate once they turn 15, but that they also become vulnerable to being booted off of their territory. If you have paid attention closely through the litany of data I have dumped on you, you have probably noticed one final pattern: the ABJ analysis showed senescence occurring in a younger age class than did the analysis of territory holders! That is, male ABJs senesce at age 15, while male and female territory holders show no senescence until age 20. This is a brand new finding that I am still puzzling over, but there is an obvious explanation. Territory holders are likely to comprise a fitter class of adult loons that have shown their ability to fight for and defend territories and also rear chicks. In contrast, ABJs are only chicks that have survived to adulthood and returned to the study area. They are not “battle-tested” by having claimed a territory and bred there. Much later senescence among the evolutionarily fittest set of loons in the study area should not surprise us. I am not ready to stake my reputation on this latest finding, but if it holds up, it dovetails nicely with one of the long-standing debates among ecologists concerning territorial breeders and floaters. We have long wondered whether territory holders should be regarded as floaters who got lucky and found a territory, or whether the two groups are, in fact, distinct classes in terms of fitness. 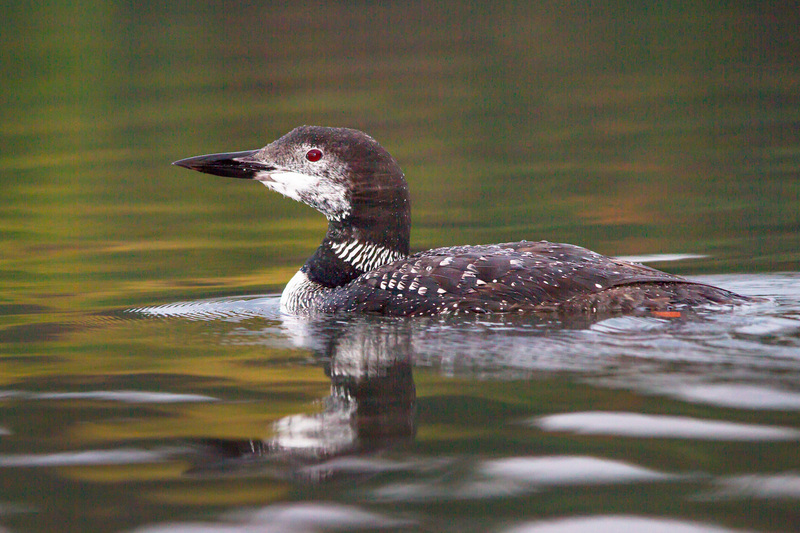 The steep drop off in survival of male floaters in loons, compared to male territory holders, would strongly support the latter interpretation. Some months ago, I reported with excitement that loons that leave their first territory — usually because they are evicted from it by another loon — have a strong tendency to settle on a second territory with similar water clarity to the one they left. It was a striking finding and one that would have added a fascinating story to ecologists’ limited understanding of how animals choose where to settle once they reach adulthood. That pattern, which initially seemed a robust one, has turned out to be trivial. Let me explain. When loons are forced to shift from one territory to another (or do so voluntarily), they typically settle on a second territory very close to their first one. Often they move to the lake next door or even settle on a different part of the same lake. What we thought we had found was that those “resettlers” carefully choose to settle on second lakes of similar clarity to their first lakes. But such a pattern is tricky to show conclusively. In order to do so, one has to determine how similar 2nd lakes would have been to 1st lakes if loons had settled at random and compare the actual pattern to random settlement. The problem we ran into was spatial autocorrelation. Spatial autocorrelation simply means that within a large area, two points that are physically close to each other resemble each other more closely than two points that are farther apart. It turns out that lakes of similar clarity tend to be clustered. That is, if one lake is clear, then its neighboring lake is likely to be clear also. The same is true of murky lakes. So while we thought that loons were purposely choosing to settle on second lakes of similar water clarity to their first ones, they were merely settling on lakes near their first one which happened to be similar in clarity to their first because of proximity. In other words, we have no evidence that choice of lakes is non-random. It took us a long time to discover the error. In fact, Mike Palmer and I had written up this finding and submitted it for publication before we realized — after running a new analysis requested by a reviewer — that spatial autocorrelation was solely responsible for our result. Naturally, I am feeling a bit like the female on Muskellunge Lake, photographed recently by Linda Grenzer. A month or so ago, this bird and I were on top of the world — she because she and her mate had just fledged two chicks (a bumper crop for loons) and was in her showy black and white formal attire; I because I had an exciting finding that I could not wait to share with colleagues. Now the luster of the recent past is gone. The female’s chicks have dispersed to fend for themselves, she has lost her gaudy summer plumage, and she is about to resume survival mode during migration and winter. I have lost my thrilling discovery and will have to pick myself up, dust myself off, and attack some other scientific question. Luckily, the Loon Project supplies an endless string of questions. One that tantalizes me at the moment: do chicks that fledge and leave their natal lakes to forage on other lakes nearby favor those that resemble their natal lakes? Such a result, if it occurs, would dovetail nicely with our finding that the first lake a loon ever settles on as an adult (at 4-7 years of age) tends to be strongly natal-like in size and pH. This result (he adds quickly) is not confounded by spatial autocorrelation, because first lakes tend to be far from natal lakes. At any rate, I shall let you know what I find. When loon biologists measure reproduction, they often count chicks older than five or six weeks of age as having fledged. This is reasonable. Even though loon chicks remain dependent upon their parents for 11 weeks or more, almost all chick mortality occurs in the first few weeks of life. If a chick makes it to five weeks, it is almost certain to make it to adulthood. Not so during this past week. As the unpleasant photo by Dan Pagel shows, one of the the Blue-Southeast chicks died quite violently several days ago after a sudden attack by an adult. Based on the photo and the swiftness of the death, we suspect that severe heart or liver damage caused the death. Since Dan was a few hundred meters away when the vicious attack occurred, he was unable to identify the perpetrator. Regardless of what loon committed this act, it comes as a shock. The departed chick was over twelve weeks of age, healthy, and off by itself feeding when it fell victim to the brutal assault. Twelve weeks is much older — I believe as much as eight weeks older — than we had ever observed a chick to be killed by a foreign adult. In light of the tempestuous territorial scene at Blue-Southeast recently, it is tempting to view this chick as a casualty of the conflict that caused its father to lose his territory. Certainly, the new, unmarked male that had taken over on Blue-Southeast and had already been observed to peck the chicks in his first weeks of ownership is a suspect. A second possibility is that the chick carelessly strayed into the west territory on Blue Lake and was attacked by a member of the West pair for territorial reasons. But territory defense is scant and subdued at this time of year, so that explanation is problematic. I was still coming to grips with the events at Blue Lake a few days ago when I received a second piece of news, equally discouraging. One of the chicks at Buck Lake, near Rhinelander, had died. The cause of death in this case is less clear; the chick’s leg became injured a few weeks ago — a lake resident reported that a snapping turtle latched onto it! — and the chick was not able to move about effectively afterwards. Like the Blue chick, the Buck chick was far past fledging age, having reached 11 weeks. What can we conclude from the co-occurrence of two deaths in very large and healthy chicks? I think these two unfortunate events simply remind us that, while chicks that have reached near-adult size are far more likely than 2-3 week old chicks to survive to adulthood, they are still young animals. As we have reported in a scientific paper, loons suffer a higher rate of mortality during their early years. Adult loons have had years to hone their ability to feed themselves and cope with environmental hazards, including conspecific attacks; youngsters are still getting it down. Recently, Eric, a second-year team member who is experienced at reading colored leg bands, ran across our oldest loon. This male, evicted in 2007 from Little Bearskin Lake, has been cooling his heels in Bearskin Lake since his displacement and shows no indication of regaining a territory. “Blue over Silver, Yellow only” produced 14 fledglings during his breeding career, 7 of which also bred in the study area. That level of chick production places him among an elite few in our study population. Blue over Silver, Yellow only’s age sets him apart from all others. He is at least 28 years old, because he was banded as an adult breeder, which means he was at least 4 in 1991. He may be in his 30s. But a number of other loons that we have marked during the study approach this male in age — and three exceed him in productivity. The female on Upper Kaubashine (“Silver over Yellow, Red over Green”), for example, is 27 years old at a minimum. (Females first breed at no younger than 5 years of age, so her estimated minimum age is one year older than if she were a male.) She can boast having bred with four different partners on four different lakes, spanning two counties. The 25+ year-old Townline male, “Silver over Red, Orange over Green”, is unrivaled in terms of stick-to-itiveness, as he has held the Townline territory since at least 1994 — and still owns it. He has reared 16 chicks to fledging during his tenure, if we throw in the two from this year. Only two loons have raised more young: the current Oneida-West female (19 fledglings and counting on Oneida-East and Oneida-West) and the former Hancock male (17 fledglings from 1993 to 2009). Although it is fun to gawk at the age and breeding success of certain star individuals, my quick analysis of the study’s oldest loons reinforces another point that I have made before — and one with substantial scientific importance: females are the ones that generally live to a ripe old age in loons. The reason(s) for this gender disparity are becoming clear. Males seem doomed to die young because of their participation in dangerous battles, and perhaps also their unfortunate proclivity for attacking fishing lures and baits. Inspection of the table above certainly makes one wonder whether males should rethink their high-risk approach to both territory acquisition and foraging. Then again, maybe there are compensating benefits that offset the costs.